Check out 25 things to do in Coimbra. Just behind the Santa Cruz church in the heart of the Baixa (downtown Coimbra) you’ll find Se7e restaurant. 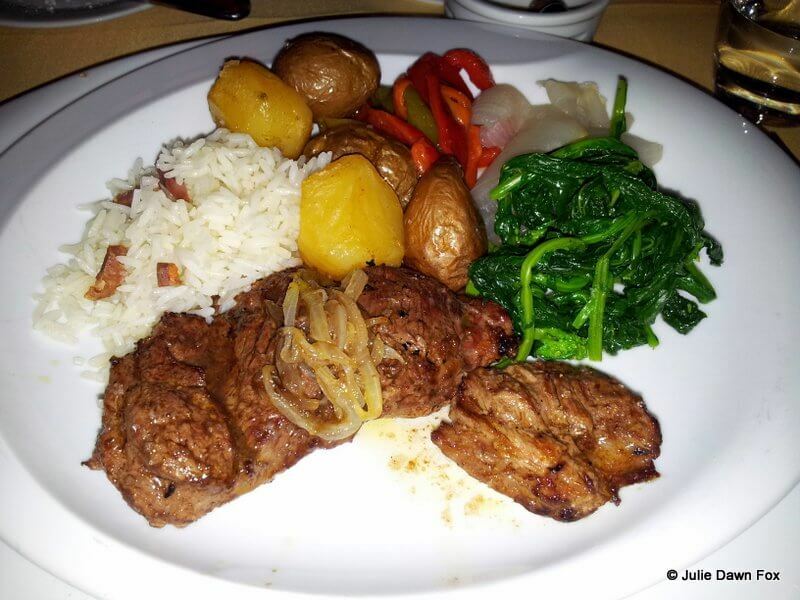 The menu features firm Portuguese favourites served with flair and local produce. Add to that an extensive wine list and knowledgeable staff and you’ll find this is an ideal venue for discovering Portuguese flavours. My favourite starter is the poached egg and peas. It gets busy so book a table. If you choose to eat early, you will be dining among other foreigners but Sete is deservedly popular with locals too. This cosy restaurant is run by a Dutch/Portuguese couple who are passionate about olive oil. They use olive oil from their own plantation and other quality producers in all their dishes, including desserts. Their imaginative menu has options for vegans and vegetarians as well as meat and fish lovers. They can also arrange tasting sessions (if you’re willing to pay for the minimum group size of 6 people) and have a small shop next door selling quality olive oils. Rua da Sota 44. Tel: 910 718 182. Open Tuesday-Saturday for dinner plus Saturday and Sunday lunch. Dux Taberna Urbana is becoming my favourite restaurant in Coimbra thanks to the range of delicious and well prepared petiscos, the Portuguese version of tapas. It’s very popular, especially at lunch time because of the ‘menu do dia’, so book a table or get there early. Rua Dr. Manuel Rodrigues 59. Tel: 239 093 723. Open daily for lunch and dinner. You’ll probably need a car or taxi to get to this restaurant, which is on the other side of the river. The complex offers a swimming pool, hence the name, and a smart restaurant with good food and wine. Dori and I particularly like the cataplana, a fish and seafood dish that’s cooked and served in a copper dome. 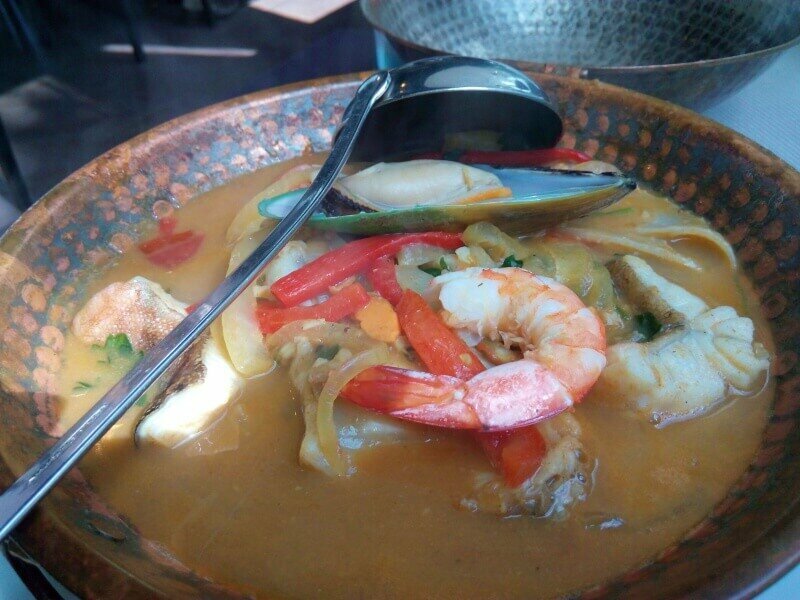 You usually need 2 people to be able to order a cataplana but Piscinas will do individual servings. Loggia is actually housed within the Machado de Castro National Museum and has great views over the city. Lunchtimes are usually a buffet with two hot dishes whereas evening meals are a la carte or sometimes a set menu. See this review of Loggia restaurant for more information. When the museum is closed, access is around the side and up the steps. Largo Dr. José Rodrigues. Tel: +351 239 853 076. Open daily from 10 am to 6 pm and until 10:30 for dinner Wednesday to Saturday. This Coimbra restaurant is quite an experience. The tiny dining area is lined with scraps of paper with notes of appreciation from guests. Rustic and hectic, there’s usually a queue for a table (no reservations possible) so get there early or be prepared to wait in line. 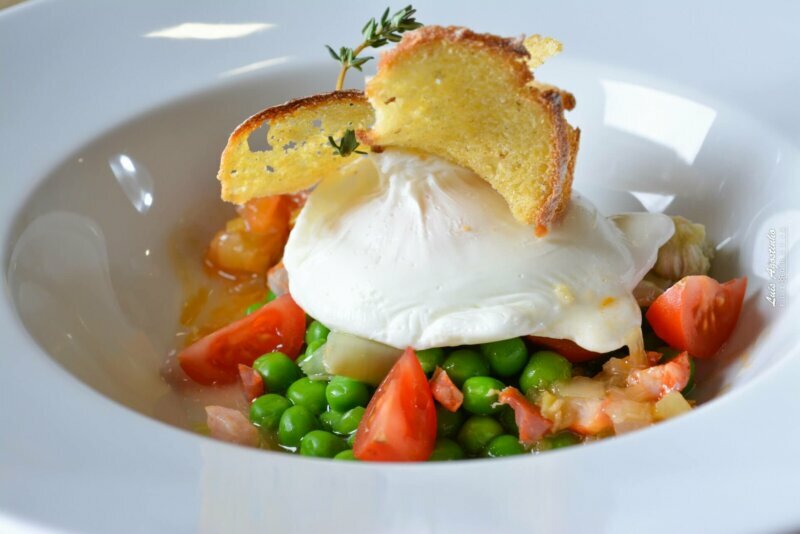 Ossos means bones so expect meaty dishes although bacalhau (cod) also features on the menu. The javali (wild boar) is tasty and very filling. Beco do Forno 12 Coimbra. Tel: 239 823 790. Open for lunch and dinner Monday to Saturday. Mike and I refer to A Taberna as the birthday restaurant as we’ve often been here to celebrate birthdays and anniversaries. The food is consistently good, especially the vitela (veal) and the hunk of crusty home made bread with requeijão (ricotta) cheese we usually have as a starter. One of the best features of this restaurant is that the waiters bring a selection of six side dishes to the table for you to choose from, including three types of vegetable. You can have a second helping too. Don’t be put off by the neon sign outside. The dining area is fairly small and cosy and is simply decorated. If you sit at the back, you’ll be able to see the kitchen and watch dishes going in and out of the wood-fired oven. It’s probably not the best place to sit in summer but in winter, you’ll be nice and toasty. Wine lovers will also appreciate the fairly extensive list. The waiters have been here for years and can confidently recommend suitable pairings for you. Rua Combatentes da Grande Guerra, 86. Open for lunch Tues-Sat and dinner Mon-Sat. Veal with vegetables, always a good choice at A Taberna. 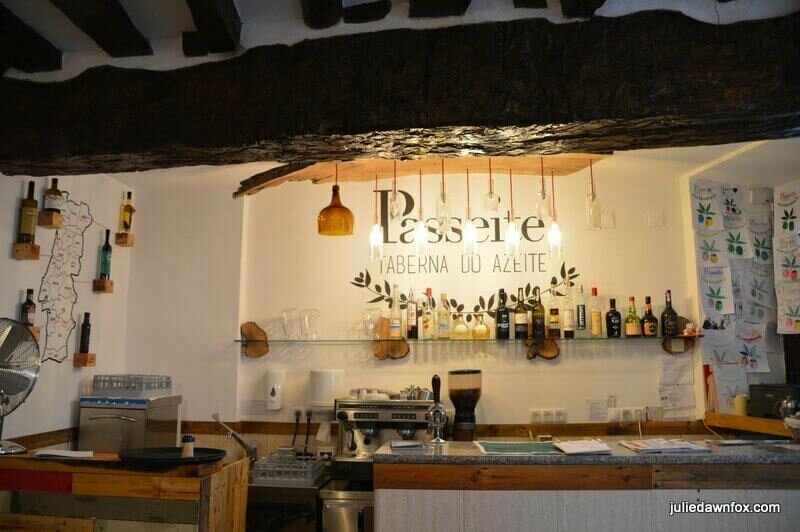 This cute tasca serves good wines and quality Portuguese petiscos at the base of Quebra Costas. There’s a strong chance of spontaneous fado performances. Rua Quebra Costas 12. Open daily from 2 pm to 11.45 pm. If you need a break from traditional Portuguese fare, the cute and funky Fangas Mercearia may be just what you’re looking for, especially if you’re a vegetarian. Fangas Mercearia Bar in Coimbra used to be a grocery store and still sells posh tinned fish and selected local produce. Mix and match from tapas-sized portions to create a snack, a light meal or whatever you need. They’ve got open sandwiches with more than just ham and cheese; stuffed mushrooms, peppers and tomatoes; traditional Portuguese sausages with a twist and lots more besides. The sweet potato fries and chocolate cake are particularly memorable. Service can be a little slow and there aren’t many tables so you should book ahead for peak times and try to be patient. 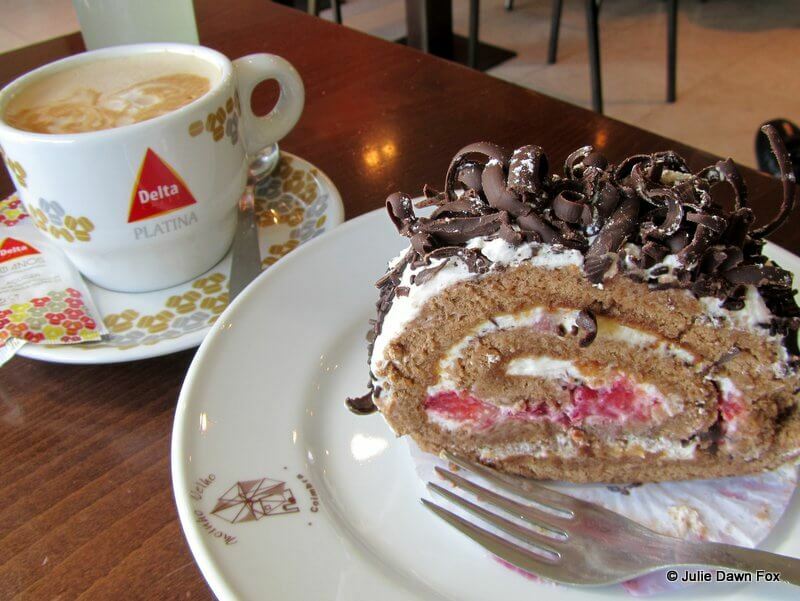 Conveniently located at the base of the monumental steps leading to Coimbra University, this busy bakery sells delicious cakes and bread as well as cheap but tasty meals in the café. There are usually a few daily specials to choose from and a menu of firm favourites. Rua Castro Matoso 49. Open daily from 6 am to 10 pm. 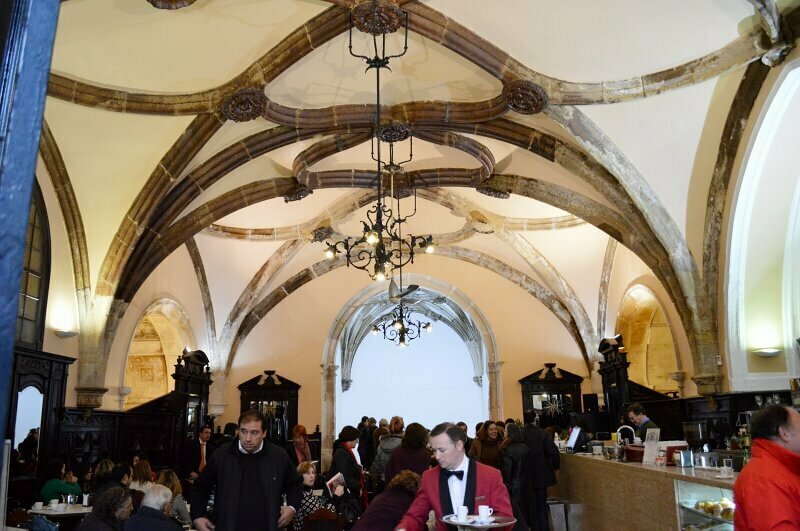 The vaulted ceilings, dark leather and wood chairs and waiters in waistcoats lend Café Santa Cruz a medieval air. This is not surprising as it used to form part of the neighbouring Santa Cruz church and monastery and was built in the 16th century. They often have fado shows here and literary gatherings. Choose from the outdoor terrace with views of the bustling shopping street, the elaborately carved entrance to Santa Cruz church and Praça 8 de Maio or the calm, cool interior. Praça 8 de Maio, Coimbra. Open 8 am to midnight every day. 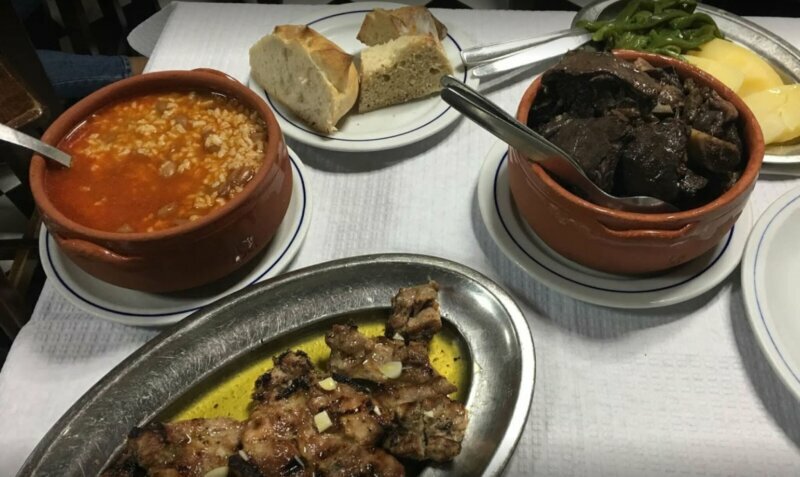 There’s another branch of Moinho Velho (Old Windmill) in the Baixa (R. João de Ruão 27) but the one in Solum, near the football stadium is the original and has more atmosphere. After church on Sunday mornings, there’s often a queue of well-dressed and freshly coiffed locals waiting for tables although it’s always busy. As well as delicious cakes they have a wide selection of interesting breads in the bakery section, handmade chocolates and good quality savouries. If you want something to take out, just be aware that each counter has a separate queue and your purchases, including anything you have from the café, will be added to your tab. When you’re done, queue again to pay at the till by the door. Rua Jorge Anjinho, 7. Open daily from 8 am to 8 pm. Cross over the Santa Clara bridge from downtown Coimbra and turn left just before Portugal dos Pequenitos to find one of my favourite places to go for a drink. As the name suggests, Galeria functions as an arts space as well as a bar. It’s inside an old house so there are plenty of cute rooms, all decorated differently with original artwork on the walls. There’s even a workshop and craft shop downstairs plus a space for live bands and performances. The outdoor terrace is a great place to admire the view of Coimbra from with various seating areas and options so have a wander before you pick your spot. 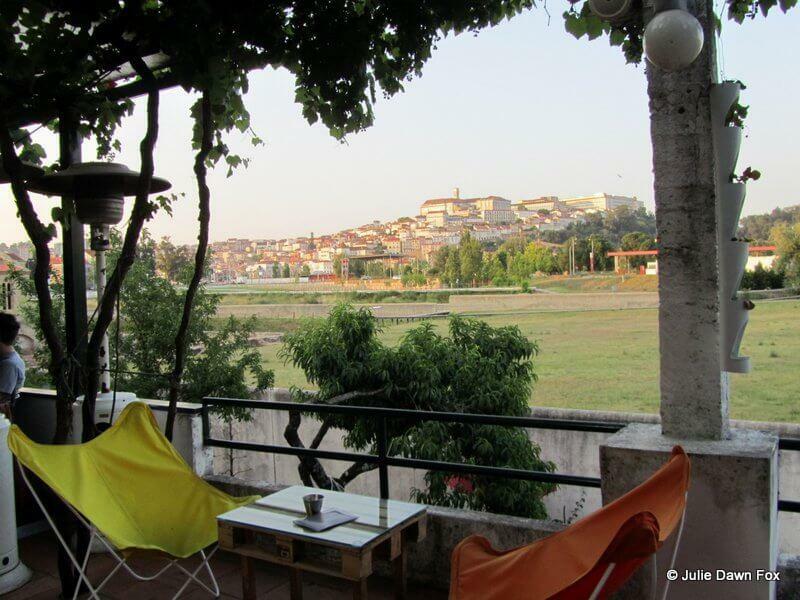 For more suggestion for things to do in Coimbra, including a cat café, see this post. I visit Coimbra quite often and always eat at Cervejaria Parque, on Av. Emidio Navarro opposite the park, just down from the Ibis Hotel. It’s popular with locals and the food is simple but delicious. Hi Colin, Thanks for the tip. I must have walked past it on several occasions but have never been in. It sounds as though I should, next time! 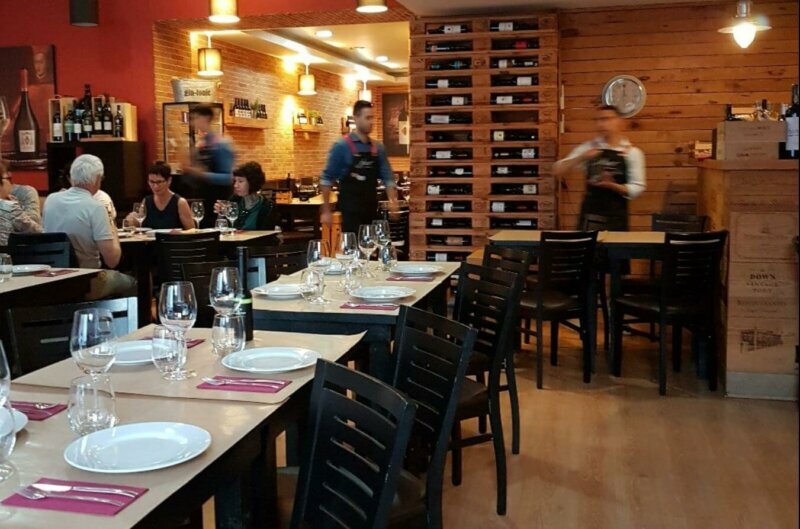 I quite enjoyed Giro Churrasqueria when last in Coimbra but in general I was not overly impressed with other places we tried although with the exception of some bacalhau (salt cod) preparations, in my opinion it’s hard to find mediocre fare in Pt. Hi Frank, Thanks for the tip and comments. I’ve been to Giro and have friends who find that it’s reliably okay, if nothing to get overly excited about. Julie, thank you very much for A Taberna. That was more than a meal, that was a celebration of excelent food. The vitela was out of this world and “baby goat” eaten for the first time, very interesting. I’m thrilled to hear you enjoyed A Taberna. I haven’t been for a while but now you’ve made my mouth water! We were in Coimbra the other day so decided to try one of your recommendations: A Taberna. It was as good as you said, perhaps a bit more than we would usually pay but the vitela was excellent. Not the nicest part of Coimbra but great if you’re doing mall shopping, we’ll certainly return if we’re in that part of town. Thanks for this! Phew! I’m always very relieved to hear that recommendations worked out well. I used to live relatively near the restaurant so it was in handy walking distance. We don’t go very often these days simply because it’s tricky to fit a meal in Coimbra into our schedules. We’re always glad when we do get around to it though! It looks great, Daniela. It’s now on my list of places to check out. Hi Julie. So I noticed you like the Se Velha area a lot. The next time you are in Coimbra go to a restaurant called Dona Especiaria (you won’t see a sign at the door or a neon flashing), but trust me. It will blow your mind how special it is. Hi João Pedro, thanks for the tip. Having looked it up on google maps, you’re right about it being discreet. Definitely an ‘insider’ tip. I’ll bear it in mind for the future. I take it you serve typical Portuguese dishes. What’s your speciality? Well, i’m not an insider. Just a Coimbra student who stumbled upon this restaurant and fell in love with it immediately. I don’t want to say a lot so I don’t spoil the surprise. What I can say is there are not typical dishes. You eat what the Chef decides that day. There isn’t a menu. And, to me, the greatest think (besides the food which has an indescribable flavor) is that during the meal the Chef comes and sits with you and explains how the food is made and with what ingredients. It is an experience like I never had in other restaurants. Thanks for the tip, Luísa. I’ll check it out next time I’m in the area. Happy New Year to you, too. Are you studing in Coimbra? I think i know you from my store. Hi, you must triedYou must try the pastry Pastelaria Arco Íris in downtown (baixa). They have the best chicken pie (empada de galinha) that I know. they also have the best eclair in town. Thanks for the tip. I’ll have to check it out next time I’m in the Baixa. Oh darn, I wish i’d known about O Moinho Velho before I went to Coimbra! We always have a meal at O Serenata (Rua da Sota) when we are in Coimbra. The food (traditional portuguese) has always been very good. I like the ambience too. Thanks, Sharyn. I don’t think I’ve eaten there but I know other people who like it so maybe it’s time to try it. 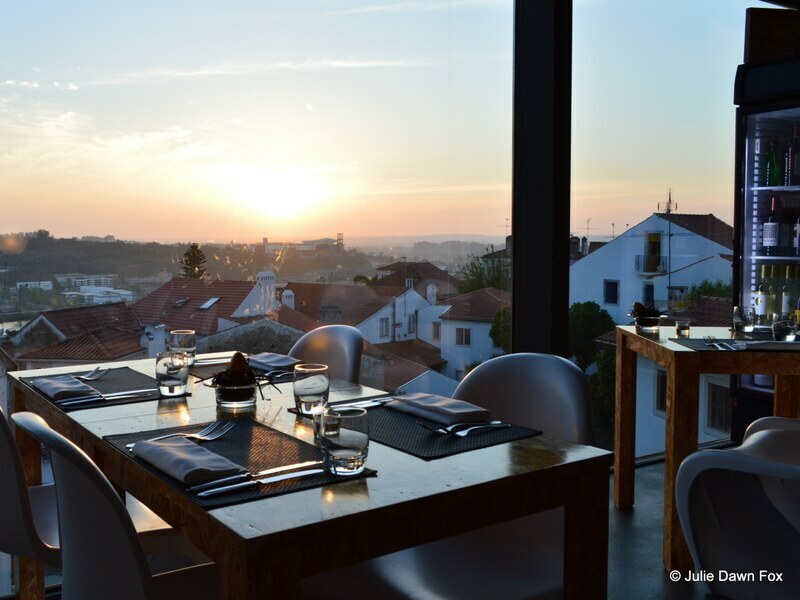 Thank you for this post, we have been to Coimbra many times as only an hour away and we love the vibrancy of the city but we have always struggled to find somewhere good to eat and have come back feeling disappointed, cheated or plain hungry! I really look forward to trying out some of these fabulous places on or future visits. I hope one of these hits the spot for you then! We also like Piazza on Praca da Republica for pizzas and salads. They have a weekday lunch menu too. Sadly, Piazza is now closed 🙁 Loggia, the restaurant at Museu Macho de Castro do a great lunchtime meal deal and are also open for dinner although I haven’t eaten there at night. have you tried out Museu Machado de Castro? The food is quite nice, and I love the view. I’ve been to the Museum several times but so far I’ve only had a drink in the café there. I keep meaning to try the restaurant, especially for the menu do dia – it looks quite good value and, as you say, the view is fabulous. Thanks for the tip. Thanks for another informative, human review. We are looking forward to relocating from the Algarve to somewhere near Penela. Thanks, Kevin. Good luck with your search. Penela is a lovely area so I’m sure you’ll find a great place. It’s better connected to motorways than where we live so getting to bigger cities when necessary should be easy enough even if you are living in the sticks.